The UK Pesticide Safety Directorate has informed me that the EU review of glyphosate is currently underway and although they tell me that my observations in respect to the cholinesterase depressing action of glyphosate are to be reported to the review body by their representatives they suggest that I should contact you with any additional comments I wish to make. This is the reason for this letter. I have been contacted by many people who have experienced adverse health effects when using glyphosate based products. The symptoms range widely from sore throats and headaches to dizziness and even permanent disability which at first I thought was very strange given the claims made by those who would promote its use as a "harmless" herbicide often given away free to gardeners with watering cans. However, as is all too common with pesticides, it appears that the entire world has been given false information as regards the action and safety of this group of chemicals. "Glyphosate is an organophosphate which has no antcholinesterase activity. It inhibits an enzyme which is essential for the synthesis of aromatic amino acids in plants, but is not present in man…….It is believed that this surfactant (polyoxyethyleneamine) was responsible for some of the features observed in cases of severe poisoning due to glyphosate containing products………The new surfactants are expected to be less toxic than polyoxyethyleneamine but there is inadequate human experience to verify this." The emphasis is mine. You will no doubt observe several areas of concern in that statement. Firstly it is an admission that formulations of glyphosate have been released into the environment and then found to be unsafe. There is even evidence that it has anticholinesterase action. Secondly there is the suggestion that it is merely believed and not proven that the surfactant was responsible for some of the adverse health effects experienced. Thirdly that the surfactant was changed on the basis of that belief with no certainty of safety. In fact reports of adverse human reactions are awaited in order to prove that there is no risk.. Sadly the manufacturers do not recognise adverse effects from their chemicals unless they are confirmed by the UK Health and Safety Executive. This body has been shown to use every means possible to avoid recognising poisoning by pesticides – even when there is medical evidence supporting the diagnosis. The result is that few, if any, adverse reactions will be reported to the manufacturer and those vital early signs of danger will have been missed. This is an unsatisfactory and a dangerous situation, not just for the victims directly involved but for the entire population of the world since if the manufacturers have their way our crops will depend on the widespread use of the chemical. Very slowly it is becoming apparent that the authorities are beginning to see that the safety data supplied to them by the manufacturers has not been accurate and in fact some reports suggest that data has been deliberately fabricated to give the impression that the product presents no risk. In private correspondence it has been reported to me that one of the UK Government’s Senior Medical Advisors, Dr Timothy Mars who adjudicates on pesticide incidents causing ill health as part of his work with the Pesticides Incidents Appraisal Panel, has actually confirmed that glyphosate is a low level cholinesterase depressant . Strange then that all glyphosate products escape the current review of anti-cholinesterase chemicals undertaken by the UK Ministry of Agriculture Fisheries and Food. Repeated requests for an urgent review of data for glyphosate formulations because of the special place in the food chain as systemic herbicides which will soon be unavoidable have been ignored. Evidence supporting the anti-cholinesterase properties of glyphosate recently came to me from the United States of America when I was informed that a Roundup formulation was used as an insecticide indoors. I must say that I did not believe the story at first but I am assured that evidence exists which proves that Roundup severely depressed the cholinesterase levels in the exposed victim. In my efforts to confirm or disprove this report I tested a formulation sold in supermarkets in a ready to use form and to my surprise I discovered that insects died almost instantly. The experiment was repeated with the same worrying result. I notified the Government and the Pesticide Safety Directorate with no response. Concerned about the possible effects on wildlife in general and birds in particular in respect of destruction of their food supply I informed the Royal Society for the Protection of Birds and again there was no response. In order to ensure that this information was put on record I photographed the demise of insects treated with the ready to use Roundup herbicide using the clock which appears as broadcast with the television programmes here in the UK as background. 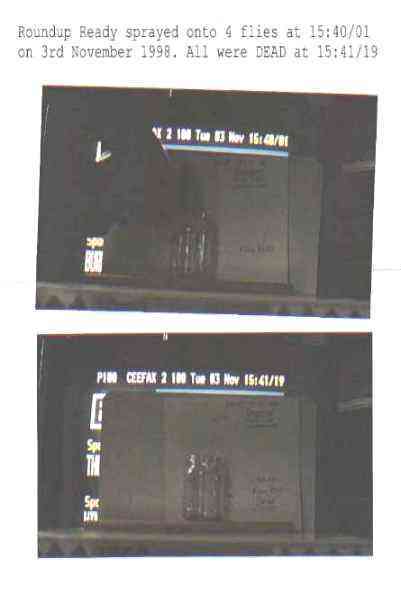 Copies of those photos were then sent to the BSE Inquiry and after some persuasion they eventually acknowledged receipt. BSE, as I am sure you are aware, began in the late 1980s in the UK. There has been much support for the theory that the disease was caused by organophosphates and Roundup is included in that chemical group. It may be significant to note that two approvals for Roundup were granted in the UK in the years preceding the BSE outbreak. In 1981 the ADAS advisory service of the UK Ministry of Agriculture Fisheries and Food was recommending that arable farmers could use pre-harvest applications of Glyphosate on cereal crops 3 such as wheat, barley and oats as a means to control persistent grass weeds. The only concern shown was for use on malting barley for which permission had to be obtained from the potential purchaser of the grain. By 1985, presumably because no obvious adverse reactions had been recorded, that same advisory group was advocating the use of glyphosate on grassland 4 and significantly they declared that it would be good practice to graze the grass or preserve it as hay or silage after treatment. This practice can only have added to the already high burden suffered by the cattle from OP insecticides in grain and straw, Lindane in grass, OPs in warble treatments and wormers, and fly control chemicals. It would appear that these experiments paved the way for the use of Roundup on all crops before harvest as we now see in genetically modified crops which are resistant to glyphosate. There are reports that BSE cases are now being hidden as a means to support the now discredited meat and bone meal theory. If so it is extremely foolish and irresponsible, especially if the BSE cattle indicate a risk from glyphosate. Returning briefly to the reports of adverse effects on human health the earliest indications of problems came when I heard that men who handled thousands of bales of freshly harvested straw regularly every year began to experience rashes on their arms. They wondered why this should be and discovered that it only happened with bales from fields sprayed before harvest with glyphosate. Other reports suggested that individuals already poisoned by organophosphates had collapsed when walking through the stubble of crops treated pre-harvest with glyphosate. Another man is reported to have operated the line-making machine used on sports fields. He was disabled permanently by his work which involved the mixing of the whitening substance with a glyphosate formulation. The mixture was then used to make permanent lines through which the grass could not grow. To his horror he discovered that phosphine was released during the application process. The UK Government paper Notes on the Diagnosis of Prescribed Diseases 5 lists the dangerous effects caused by phosphine but it also notes that "Phosphine is usually liberated accidentally when acid and metal or alkali react to produce hydrogen. The action of hydrogen on phosphorus liberates phosphine"
DO NOT MIX, STORE OR APPLY ROUNDUP IN GALVANISED OR UNLINED MILD STEEL CONTAINERS OR SPRAY TANKS. DO NOT leave spray mixtures in tank for long periods and make sure tanks are WELL VENTILATED. It is perfectly clear then that Roundup presents a serious risk to users in certain circumstances. Now I will return to other and perhaps more serious aspects where the data seems less than accurate. This concerns cancer. In recent years glyphosate was regarded as a potential treatment for cancer. Nothing appears to have come of that research so far but the very existence of such plans proves beyond doubt that the chemical can influence human cells and is not simply restricted to plant amino acids. My wife and I know to our cost that chemicals which can cause cancer are often used to treat cancer. Currently she is undergoing chemotherapy using drugs which are derivatives of Mustard Gas in order to prevent a recurrence of a rapidly invasive malignant breast tumour of environmental origin. Lindane is the suspected causative agent but it is known that Mustard Gas is in itself carcinogenic and yet derivatives of such chemicals can control cancers by damaging cell growth in tumours. In the Journal of Pesticide Reform/Fall 1998-Vol.18,No.3. Herbicide Factsheet6on Glyphosate (Roundup) they report that "Given the marketing of glyphosate herbicides as benign, it is striking that laboratory studies have found adverse effects in all standard categories of toxicological testing. These include medium-term toxicity (salivary gland lesions), long-term toxicity (inflamed stomach linings), genetic damage (in human blood cells), effects on reproduction (reduced sperm counts in rats; increased frequency of abnormal sperm in rabbits), and carcinogenicity (increased frequency of liver tumors in male rats and thyroid cancer in female rats). Glyphosate has been called "extremely persistent" by the U.S. Environmental Protection Agency, and half lives of over 100 days have been measured in field tests in Iowa and New York. Glyphosate has been found in streams following agricultural, urban, and forestry applications. Commercial glyphosate herbicides are more acutely toxic than glyphosate. The amount of Roundup (containing glyphosate and the surfactant POEA) required to kill rats is about 1/3 the amount of glyphosate alone. Roundup is also more acutely toxic than POEA. Glyphosate-containing products are more toxic via inhalation than orally. Inhalation of Roundup by rats caused "signs of toxicity in all test groups," even at the lowest concentration tested. These signs included gasping, congested eyes, reduced activity, and body weight loss. Lungs were red or blood-congested. The dose required to cause lung damage and mortality following pulmonary administration of two Roundup products and POEA (when forced into the trachea, the tube carrying air into the lungs) was only 1/10 the dose causing damage orally. The report states that adverse effects have been identified in each standard category of testing (subchronic, chronic, carcinogenicity, mutagenicity, and reproduction). The publicly available studies of glyphosate's ability to cause cancer were all conducted by or for its manufacturer. In 1991, EPA alleged that Craven Laboratories, a company that performed studies for 262 pesticide companies including Monsanto, had falsified tests. "Tricks" employed by Craven Labs included "falsifying laboratory notebook entries' and "manually manipulating scientific equipment to produce false reports. " Roundup residue studies on plums, potatoes, grapes, and sugar beets were among the tests in question. The following year, the owner of Craven Labs and three employees were indicted on 20 felony counts. The owner was sentenced to five years in prison and fined $50,000: Craven Labs was fined 15.5 million dollars, and ordered to pay 3.7 million dollars in restitution. Although the tests of glyphosate identified as fraudulent have been replaced, this fraud casts shadows on the entire pesticide registration process. In 1996, Monsanto Co. negotiated an agreement with the New York attorney general that required Monsanto to stop making certain health and environmental claims in ads for glyphosate products and pay the attorney general $50,000 in costs. Claims that glyphosate products are "safer than table salt, "safe for people, pets, and the environment, and degrade "soon after application" were challenged by the attorney-general because they are in violation of the Federal Insecticide, Fungicide and Rodenticide Act (FIFRA), the national pesticide law. According to the attorney general, Monsanto had engaged in "false and misleading" advertising. EPA made a similar determination about Roundup ads in 1998, finding that they contained "false and misleading" claims and were in violation of FIFRA. However, EPA took no action and did not even notify Monsanto Co, about the determination because two years had elapsed between the time that the ads were submitted to EPA and the time that EPA made the determination. At this point I would like to relate a sad story about a friend of mine. He was working in his garden when the spray boom covered him in Roundup. He had breathing problems and a rash but the operator of the machine declared there was no risk and thought it was a joke. His doctor told him not to be concerned as the symptoms would pass without further trouble. Just two and a half years later my friend died with cancer of the pancreas and his specialist dated the start of the cancer to a time shortly after the incident. I understand that cancer of the oesophagus has also been linked to the use of Roundup and I know of at least three cases of such incurable cancers in keen gardener friends who have used Roundup regularly. I hope the information in this letter helps in your review and that there will soon be restrictions on the use of this chemical. As a former farm manager I was happy to see the introduction of the chemical as it replaced gramoxone which we all knew to be deadly in effect on humans with no antidote available. However we knew where we were with the chemical and no-one took risks with it for fear of death. Glyphosate formulations imply that no harm can be done and because this is not true the risk is greater. The danger is further enhanced with the introduction of Genetically Modified crops designed to withstand repeated applications of this chemical. Such actions will have devastating effects on the environment and upon the health of those using the chemical, living near areas sprayed with the chemical, and those eating the food which will inevitably contain residues of this systemic organophosphate herbicide / insecticide. The dangers are obvious and I urge you to demand independent research and immediate restrictions on both its use and the importation into the EU of foods produced with the aid of the systemic poison. "Do not use on grassland if crop to be used for animal feed or bedding"
"Exclude livestock from treated fields. Livestock may not graze or be fed the treated forage nor may it be used for hay, silage or bedding." Why the change? We are eating treated grains. Despite evidence from Egypt and elsewhere in 2001 that, like other organophosphates, glyphosate does indeed inhibit cholinesterase, the UK Food Standards Agency states that they have "every confidence in the science" and continues to support the use of the chemical group. Its Chairman is reported to support the Genetically Modified crops programme which relies on this group of chemicals.